The Vinton Street elevator represents a bellwether for Tillotson Construction Co. Not only was it high and mighty but also close at hand for the company with headquarters in Omaha. Family and friends who never went to the small grain-belt towns where Tillotson put up elevators could see this one for themselves. In fact, they couldn’t miss it. And this was particularly true after Interstate 80 was completed: the superhighway went right past the complex that had risen and then expanded and finally fallen into abandonment.When I worked for a time at Omaha’s very first Federal Express office, a part-time job during my freshman year of college, I reguarly drove past the complex while on my way to the airport, having no idea my grandfather’s company had built the key elevator. And in the many times I’ve gone by since then on my return visits to Omaha, I still had no idea.The other day, speaking with my Uncle Tim Tillotson, he mentioned Vinton Street and said that Uncle Charles, the oldest son of Reginald and Margaret Tillotson, worked the night shift during the construction phase. 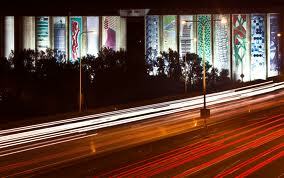 He also told me about the public art project. The abandoned elevator and silos are “bombproof,” as he put it, not readily lending themselves to any scheme for demolition. Even though my own grandfather and uncle had a hand in putting up this structure, I will admit it became rather tedious. But I object to the invective of the blogger who used the term “visual pollution” and casually denigrated the elevators. Tillotson Construction took pains to erect symmetrical buildings with graceful cupolas. 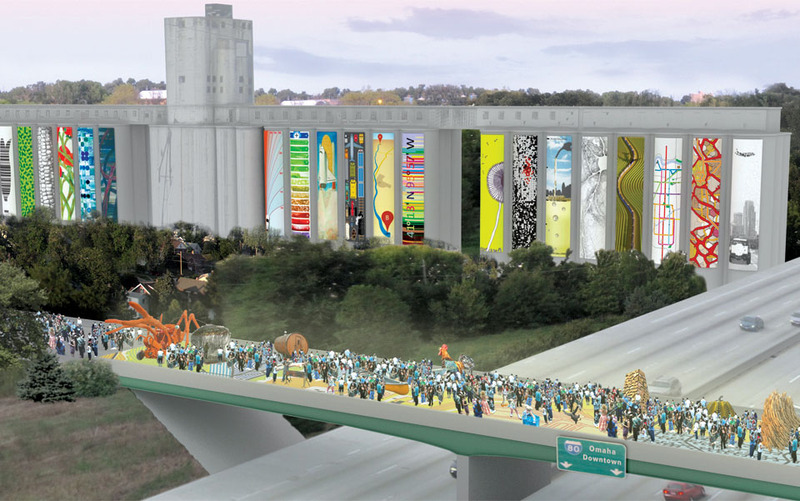 In September of 2010, her nonprofit, Emerging Terrain, weighed in with “Stored Potential: Re-Purposing the Mid-Century Grain Elevator” exercise, which allowed artists to work on a large canvas, draping thirteen banners, each of twenty-by-eighty-feet, on the silos. The theme was land use, and the result was stunning. Good news: next month, thirteen new banners will be added, this time addressing transport–the physical kind, not the ecstasy some will experience when seeing the finished result. This entry was posted in Their Work, Tillotson Construction Company and tagged architecture, Business, construction, grain elevator, public art, slip-formed concrete, Tillotson Construction.